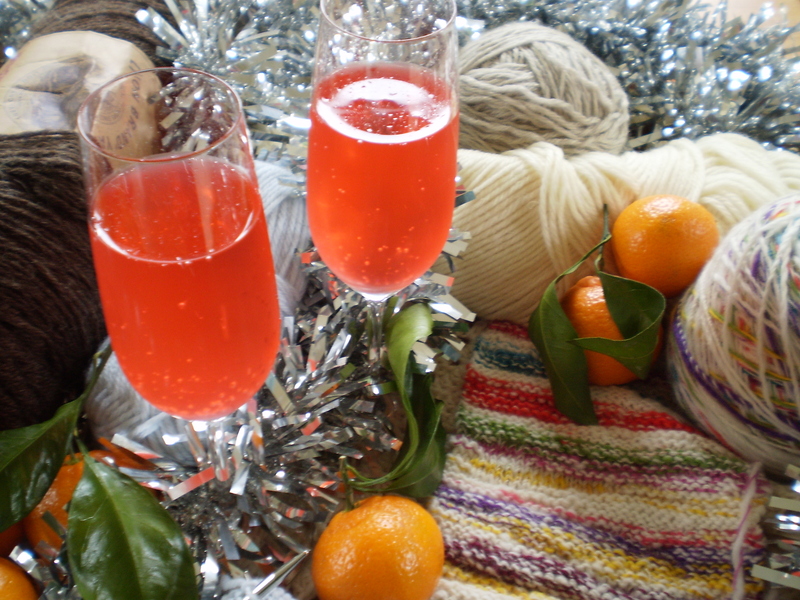 I’d like to raise a glass to all of my knitting brethren and sistren out there, on New Year’s Eve Eve; May your 2016 be full of happiness and love. May your skeins never tangle, and your needles never break. May you always get gauge on the first try. May your sweaters knit up faster than expected. May you never have to tink back an entire row, and when you do make a mistake, may you find it before it’s too late. May you never be stuck in a waiting room without your knitting. May your LYS always have the yarn you’re looking for (and in the right colorway too!). May you always buy enough of a dyelot to finish a whole project. And, may you never stop knitting. 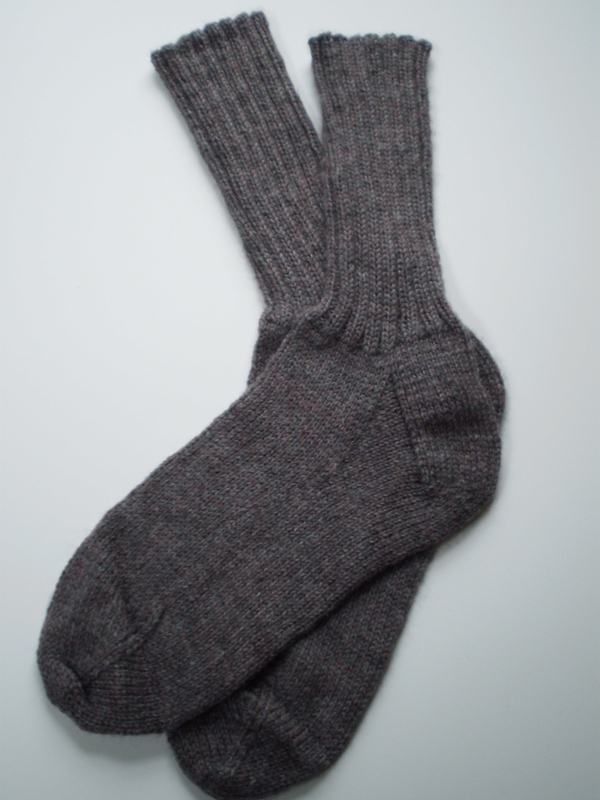 This entry was posted in About the Blog and tagged knitting, new year, New Year's, new year's eve, toast on December 30, 2015 by onemilljellybeans. I don’t have anything profound to say today, or even anything that interesting. I just want to wish you a Merry Christmas. May your day be filled with warm mittens, fluffy sweaters of the finest merino, and knitting free from mistakes. This entry was posted in About the Blog and tagged christas knitting, christmas, knitting, merry christmas on December 25, 2015 by onemilljellybeans. We’re in the home stretch, folks. Only two days left until Christmas. What’s that? You’re not done with your Christmas knitting yet? Why stress about it? Why not print out this letter, fill it in, pour yourself a glass of mulled wine, and kick back with a favorite Christmas movie? That’s my Christmas gift to you- the gift of relaxation! This entry was posted in About the Blog and tagged christmas, christmas gift, gift, holiday, late, mad lib, mad libs on December 23, 2015 by onemilljellybeans. The day has come, and I’ll be honest, I have a little tear in my eye. It feels like I’ve been working on these bears forever, even if it is only a couple months. I’ve watched them grow and get faces and become all fluffy and adorable, and now it’s time to send them off on their own. It’s like a bear graduation. I’ve ended up with seven bears, so not too shabby, if I say so myself. I’ve got yellow ones, and brown ones, and one with a dress. A green one, and even a naked one! (Except for a strategically-placed scarf. Oh my!) 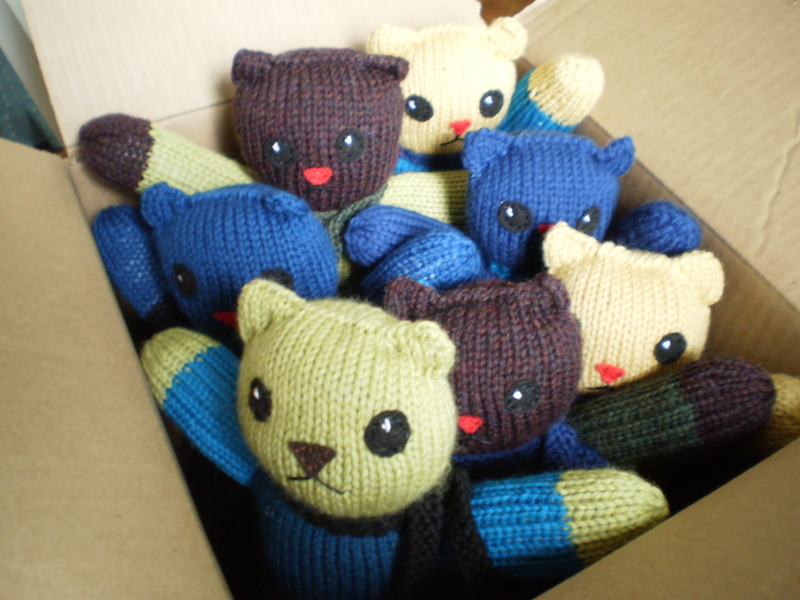 They’re all nestled together in their box, and are ready to fly to Mother Bear Headquarters in Minnesota. Goodbye bears! I had fun making you! Good luck on your adventures! 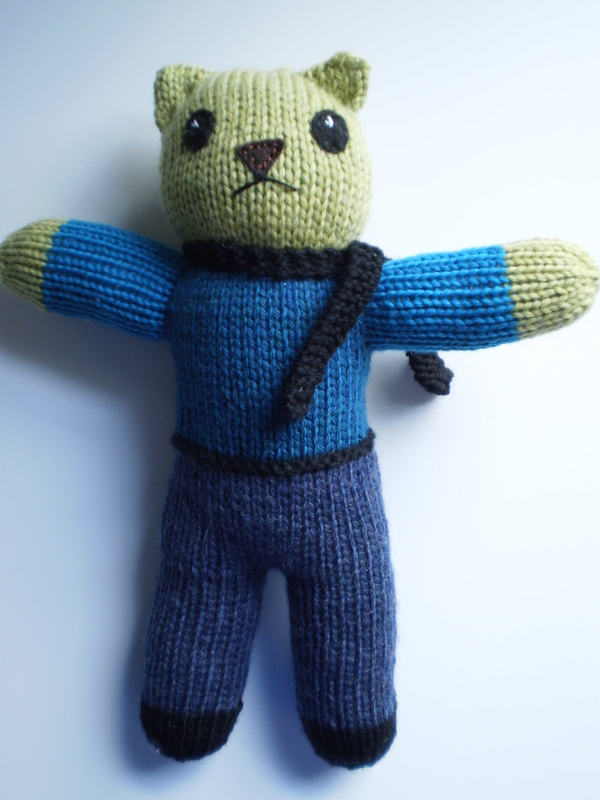 Did you make any bears, too? Have you sent them off already? 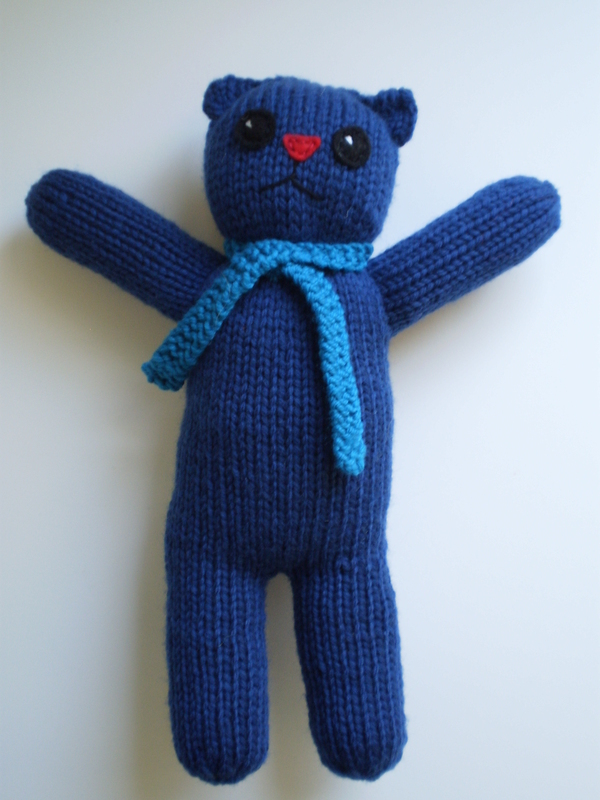 You can still make your own, just visit the Mother Bear Project for more information! 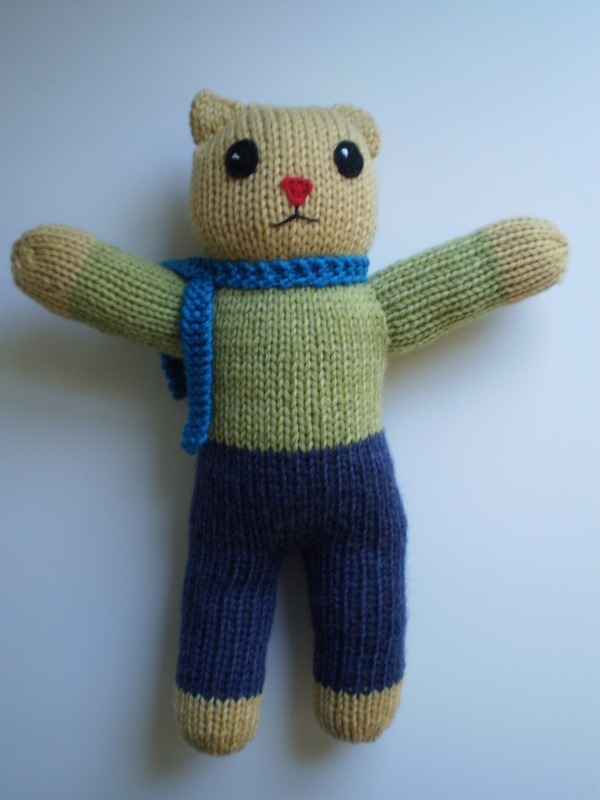 This entry was posted in Knitalong and tagged bears, charity, charity knitting, finished, finished bears, mail, mother bear, mother bear project, package, send, sent on December 21, 2015 by onemilljellybeans. We’re in the home stretch, folks! I wanted to send the bears out by Christmas, and I think I’ll make it. 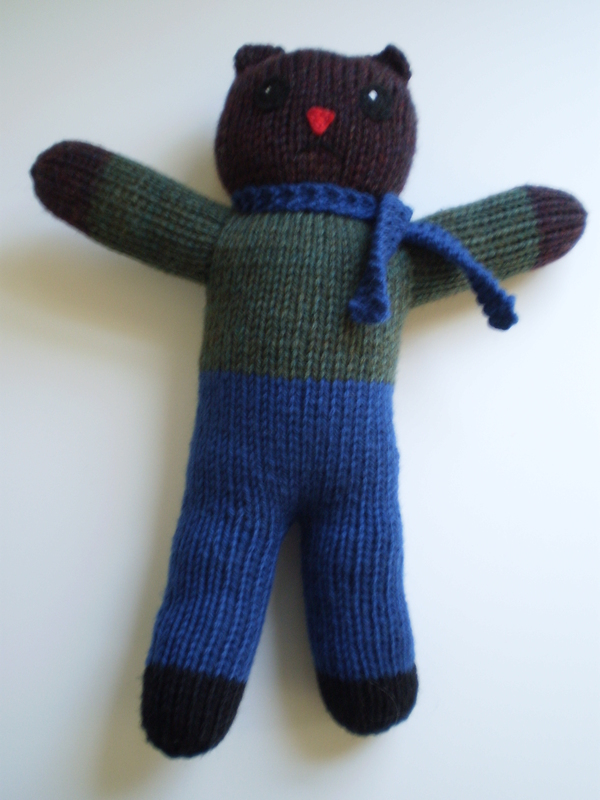 I’ve knit up seven bears in the last couple months, and they’ve all got faces. Now all I need to do is give them a little stuffing and make them lovely and chubby. Time to break out the poly-fill. Then, using the long tail left over from the cast on, I whip-stitched this guy’s head closed. Then, to make a neck and get rid of the whole potato-head thing he’s got going on, I carefully ran my needle through around his neck, starting and ending at the back of his head. I tied the ends together tightly, and wove in the ends. This formed a a nice, round, non-potato head. Adorable! Then I wove in the ends on his little scarf and wrapped it around his neck, adding a little stitch to hold the knot in place. Done! And, adorable! Thinking about joining the Mother Bear party? It’s not too late! Get your pattern here! 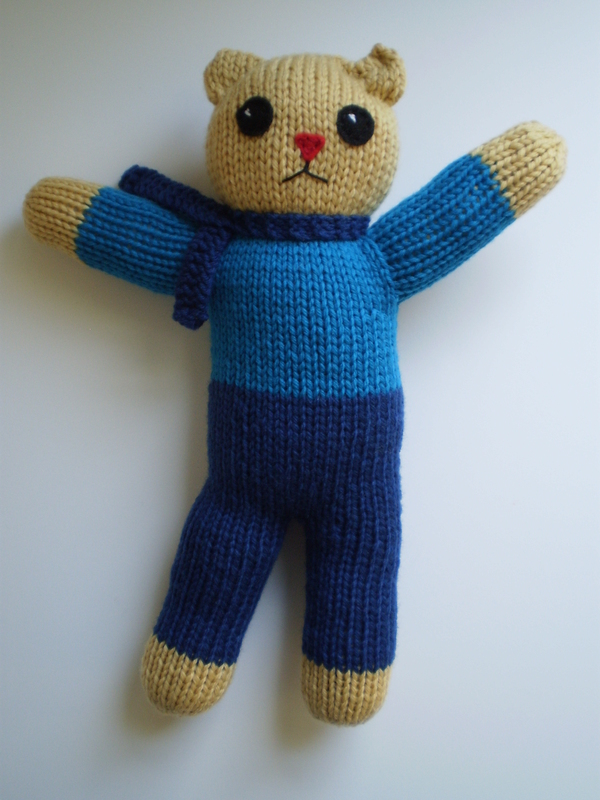 This entry was posted in Knitalong and tagged bear, charity, finishing, knitting, knitting for charity, mother, mother bear, stuffed animal, teddy bear on December 16, 2015 by onemilljellybeans. Buckle in, everyone. It’s going to be a long one. A tale of mystery! Suspense! Moths! 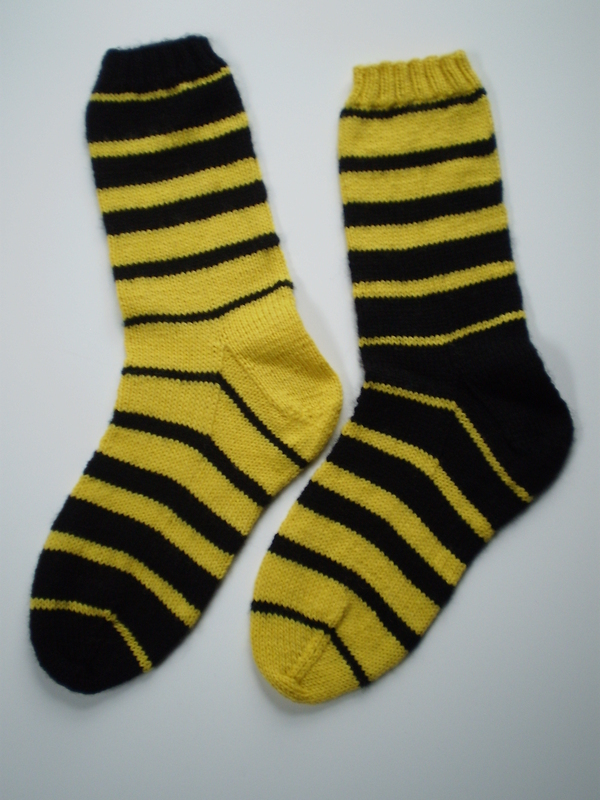 Several years ago, I knit up two lovely stockings for myself and my husband. 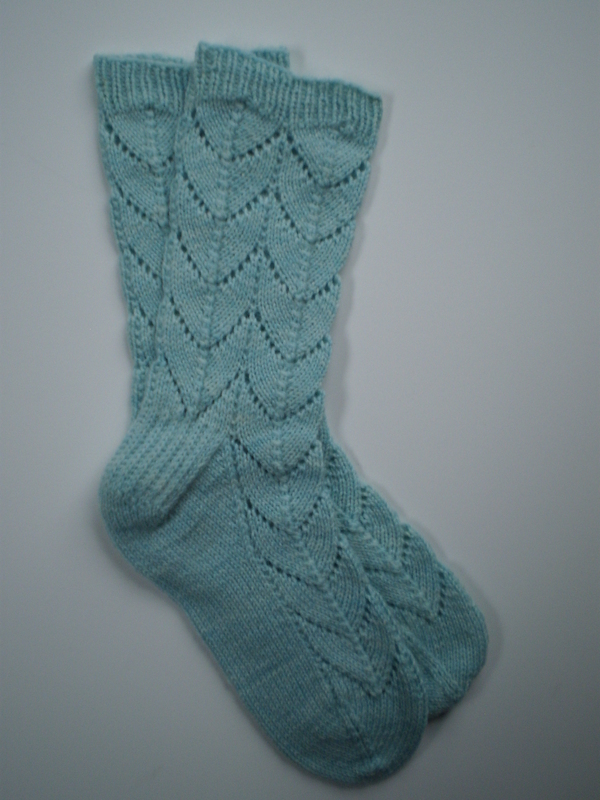 They were fabulous, squishy, Cascade 220 in carefully-selected shades of evergreen, holly berry and cream. Perfect Christmas colors. The stockings were covered in Fair Isle color work from the cuff to the toe, and I even charted out and knit our names into the tops. They were lovely and festive. Last year, we were decorating the house, and I pulled out the stockings. And horror of horrors– a silver-dollar-sized hole right in the top of my husband’s stocking. I freaked out! My heart pounded, and I felt sick to my stomach. How could this happen? What was I supposed to do? I had worked so hard on those stockings! Now some bug had come along and ripped a gigantic hole right in the middle of his name! I’ll admit- what happened next was not one of my smartest moments. But I panicked. And cut the whole top off the stocking. Just pulled out my big ol’ shears and cut off all the disgusting bug-residue, and threw it away. For a few minutes, I felt better- the offending area was now gone and it couldn’t infect the rest of the stocking (because in my mind, that’s how moths worked. Like I said, not my smartest moment). But my good mood was short lived. Because the moment I threw away the top of the stocking, I looked at what I had left. It was not good. Yarn in hand, half-dead stocking in my knitting bag, did I run home to pick up my needles and go to work? No. I panicked some more and hid the project away in my knitting room. I pulled out the Christmas stuff this year, and when I saw my lone intact stocking in the box of decorations, it all came flooding back to me- the hole, the scissors, the bad decisions. But, it’s still early(ish) in December, and I’ve mostly finished my Christmas knitting, so I sat down, determined to finally fix the stocking. First, I considered picking up stitches from the cut-off edge, and knitting up. 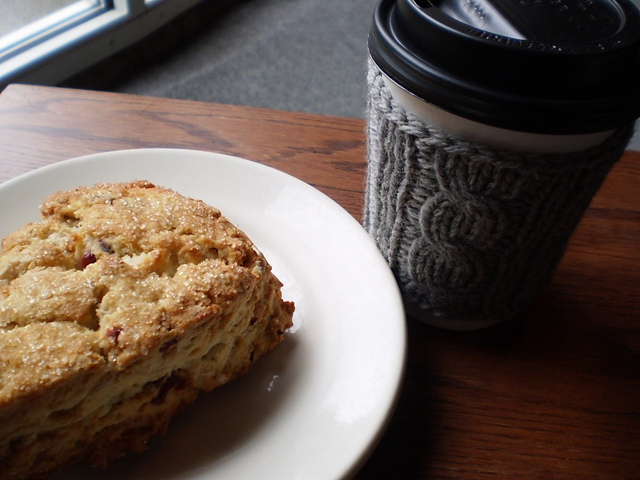 But, on second thought, I realized that knitting from the other direction would throw off the Fair Isle pattern I had worked on so carefully. I had to knit from the top down, like before, then graft the new cuff to the old stocking. Using the intact stocking as a template, and re-charting the name panel, I worked up the cuff in an afternoon. It looked good. It looked like it was going to work. I just had to figure out how to attach it. I examined the remains of the original stocking carefully. 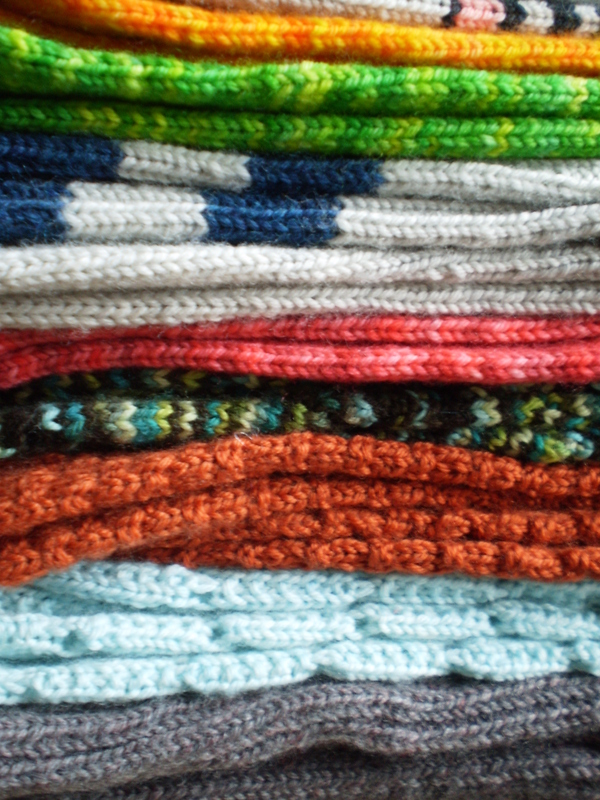 I didn’t want to have to graft the top into a row of color work (I am insane, but not that insane). Luckily, there was a solid row of green right before the snowflake panel, so that was where I decided to make my move. I carefully lined up the top with the rest of the stocking, and started grafting the live stitches onto the old stocking. It went slowly, but soon enough i had made it all the way around the cuff! I did a little happy dance and let out a sigh of relief. But that relief was short-lived, because now there was a weird giant crease all the way around the cuff where I had just finished grafting. That picture looks like I’ve just folded the knitting for dramatic effect, but I swear that was how it was laying. Upon further inspection I realized that since I had grafted a few rows down from where I had cut the stocking in that fit of insect-inspired rage, there was now a big ridge of unwanted knitting inside my stocking. I picked and pulled and before long, the ridge was gone. 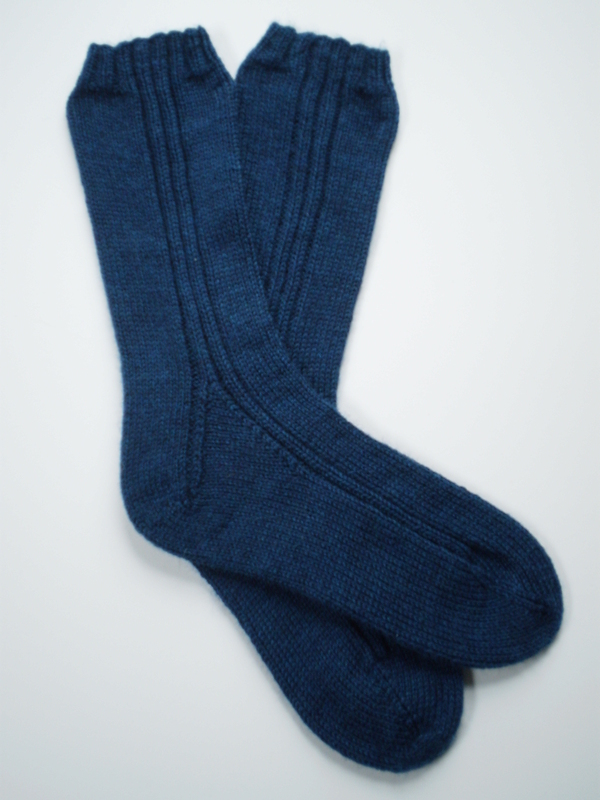 I wove in the remaining ends, and held my breath as I turned the stocking inside-out. And it was good as new! A Christmas Miracle! The stockings are now hung by the chimney with care, and I will be sure to store them in a moth-proof container this year. Have you ever had to do major reconstructive surgery on a knit item? How did it go? 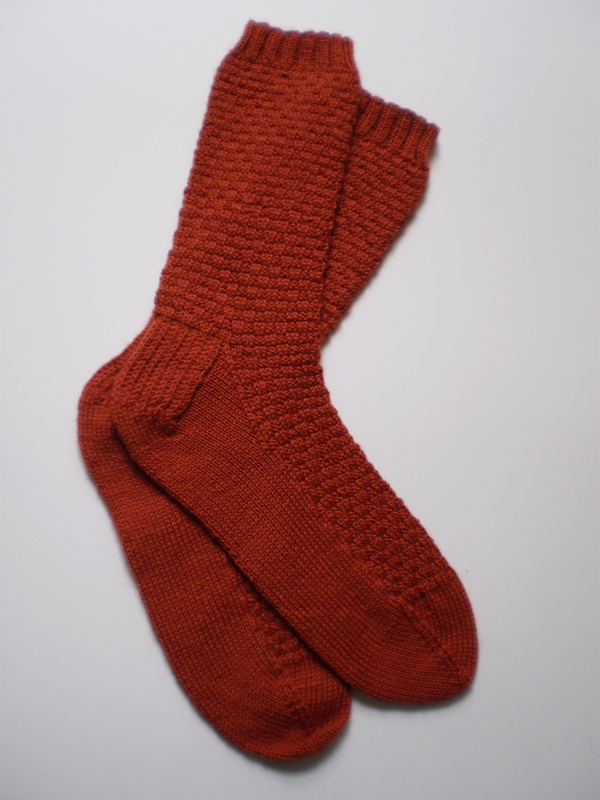 This entry was posted in On My Needles and tagged christmas, christmas stocking, fixing, graft, grafting, knitting, mend, mending, moth, moth hole, repair, repairing, stocking on December 14, 2015 by onemilljellybeans. Bears! Bears! Bears! They’re everywhere! And, now, they’re looking at me! Look at them with their little noses, and their little beady eyes. Watching. Although, I suppose I’m really the only one to blame. I did add the faces after all. Want to see how these little faces came to be? I thought you’d never ask. I’m usually a big fan of safety eyes, which, ironically are not safe for kids under 3 years old. Since I don’t know who the dolls are going to (and the instructions specifically asked for no safety eyes, and I follow rules), I made these faces with embroidery floss and little bits of felt. I think they turned out pretty cute! I started by gathering my materials: 1 un-stuffed bear, 2 eyes (cut out of felt), 1 triangular nose (also felt), a big rectangle of felt, about the size of the bear’s face (something happened with the photos, but the green felt and the green yarn are much closer in color than these pictures would have you believe), a needle and coordinating embroidery floss. I used the same technique from when I made those teeny-tiny bears from Little Cotton Rabbits. I slipped the face backing into the bear’s head, and arranged the eyes and nose on the front. Then, I carefully sewed through the backing and the knitted face to attach the features. 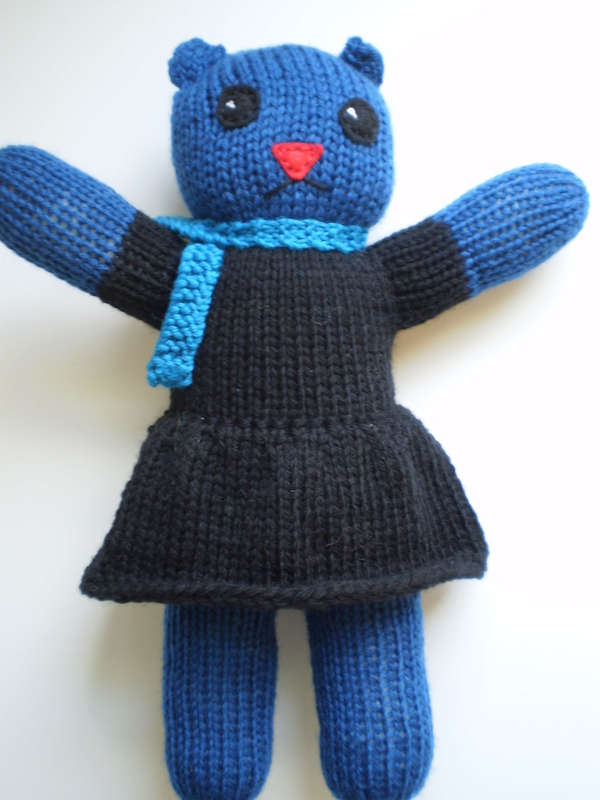 I used a back stitch to sew down the eyes and nose quite firmly. I want to be sure that the faces don’t fall off while the bear is being played with! Then, I made two long stitches slanting away from the bottom of the nose to create the mouth. I like to give my dolls/stuffed animals as neutral expressions as possible, that way the kid playing with them will be able use their imaginations more freely. Unfortunately, this bear ended up looking a little judgy. Oh well. He’s still cute. Then, to give the bear a little life, I added a couple tiny stitches in white to add a ‘shine’ to the eyes. Weird how something so little can make such a big change! How are your bears coming along? Do yours have faces yet? Wait- what’s that? You haven’t knit any yet! Get the pattern here! 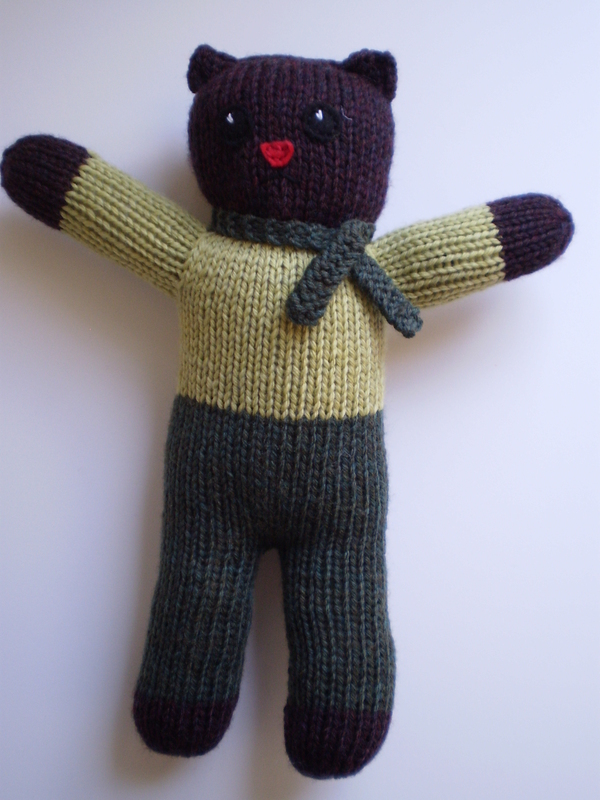 This entry was posted in Knitalong and tagged applique, bear, Embroidery, face, mother bear, mother bear project, stuffed animal, stuffed animal face on December 11, 2015 by onemilljellybeans. Have you guys ever come across Arne & Carlos? They’re a ridiculous pair of Swedish/Norwegian knitwear designers. They’ve created literally dozens of designs for their Christmas balls, each inspired by traditional Scandinavian knitting patterns. The balls are all worked following the same basic instructions (as outlined in this video), but each color work pattern is unique. (Talk about a great way to practice your color work skills!) Their book, 55 Christmas Balls to Knit: Colorful Festive Ornaments, Tree Decorations, Centerpieces, Wreaths, Window Dressings, obviously has 55 different patterns. But, they’ve got 24 patterns up for free here. Arne and Carlos say, in their video, that their Christmas tradition is to make a Christmas Ball each day leading up to Christmas. I love that idea! Maybe I’ll do it next year? It would be like a create-your-own advent calendar! 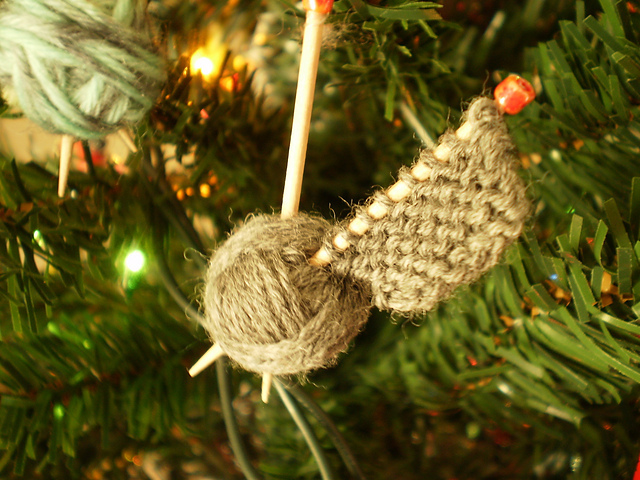 Will you be knitting up any of these adorable Christmas Balls? This entry was posted in Pattern Spotlight and tagged Arne, arne & carlos, arne and carlos, ball, carlos, christmas, christmas balls, Julekuler on December 9, 2015 by onemilljellybeans.